Citizen Science is when people make their own voluntary contributions to the progress of science from home. The advent of the Internet has made possible the active participation of a large number of people in areas like astronomy, ecology and particle physics all over the world. Why in News in India?? National Centre for Biological Sciences, Bangalore, (NCBS) is spearheading two such projects within India — Migrantwatch and Seasonwatch. They are contacted through email groups and nature clubs in a straightforward manner. 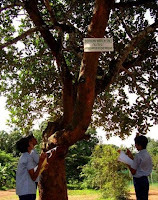 A programme in which the participant identifies a tree and observes it every week to note down when the flowers, fruits and leaves come out. They help in adding to the scientific knowledge base and also change us as citizens — to care about the environment and develop a relationship with what is around us.